A beautiful map of New York and New England in the Jansson-Visscher model. Nova Anglia Septentrionali Americae Implantata Anglorumque Coloniis Florentissima Geographice Exhibita a Joh. Baptista Homann. A significant though often overlooked piece, this is J. 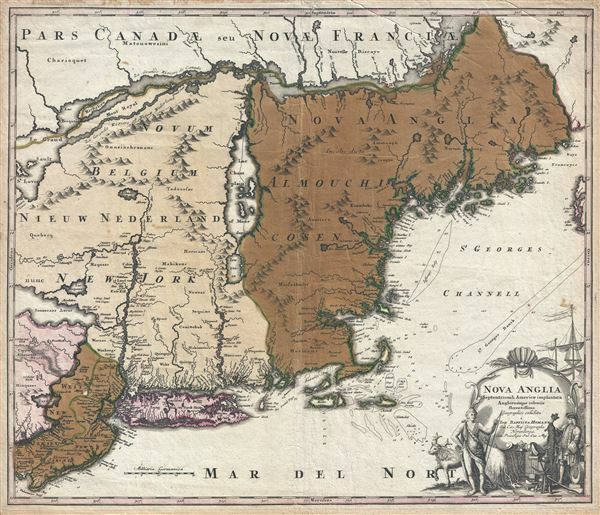 B. Homann's c. 1716 map of New England, New York, and New Jersey. Though titled 'Nova Anglia,' Homann's map actually covers a much broader area from New France (Canada) to the Delaware Bay, and from Philadelphia to Nova Scotia, inclusive of all of New England, New York, and New Jersey, as well as parts of adjacent Canada and Pennsylvania. The map identifies both European and American Indian settlements, differentiating between the two by rendering indigenous settlements as pictorial villages, huts and all, and European towns as small circles, major cities like Philadelphia and Boston being the exception. The beautifully engraved decorative cartouche in the lower right quadrant depicts an elegantly-dressed European merchant trading manufactured goods with a Native American in return for beaver pelts. This might well be a microcosmic view of the entire political and economic status of this region in the early 18th century. European settlement was sparse, largely confined to coastlines and a few inland entrepôts like Albany, shown here at the northern terminus of the Hudson River. The fur trade was the dominant force driving both settlement and trade throughout 17th and 18th century New England. Although Homann identifies some areas as Nieuw Nederland and Novum Belgium, referencing the 17th century Dutch attempts to colonize the Hudson Valley, the more aggressive English colonists had long since attained regional dominance. This is perhaps also suggestive of Homann's Dutch sources, most likely Visscher's 1689 map, Nova Tabula Geographica Complectens Borealiorem Americae Partem. Most Europeans were content to follow the example of the gentleman in our cartouche by letting the more skilled American Indians trap beavers and other fur-bearing animals, then acquiring them through trade along the coastline at various inland depots. As the cartouche work suggests, guns and metal tools were the primary currency despite being specifically forbidden by the crown - for obvious reasons. Consequently little was known of the interior aside from vague offered up by secretive Indians and a few early probes mostly associated with river systems. The Hudson River had not been explored beyond Albany. Although, the French explorer Samuel de Champlain had mapped Lake Champlain in 1609, challenges in determining Longitude caused him to place the lake well east of its actual location. Fur traders had also heard of the lake from the American Indians with whom they did business. To them, it was the ultimate source, a sort of Beaver Shangri La, however, they knew it by another name, Lake Iroquois - after the tribal confederation that dominated the area. Here Lake Champlain is properly labeled and, Lake Iroquois, just to the south, is now doubt Lake George. Homann also incorporates numerous depth soundings along the entire cost line and notes various shoals and banks, particularly around Nantucket and Cape Cod, which is rendered as an island. His incorporation of this data is no doubt associated with New England's other major industry - the Cod fishery. The banks off Cape Cod were exceptionally rich in Cod, which, when salted and dried, provided sustainable tack for most nautical voyages will into the 19th century. Additional elements of interest abound. Homann places a large lake, the Zuyd Lac, on the Delaware River. This is simply a misinterpretation of the natural widening of the Delaware at the Delaware Water Gap. In Pennsylvania, a vast swampland is an exaggeration of natural wetlands in modern day Bucks County, today known as the Quakertown Swamp, a protected area popular with birders. Sennecaas Lacus, just west of the Hudson, is most likely a mismapping of Lake Erie. Homann, J. B., Atlas Novus, (Amsterdam) 1716. Good. Some creasing and centerfold wear. Minor verso reinforcement. Goss, J., The Mapping of North America: Three Centuries of Map-Making 1500-1860 #50. McCorkle, B.B., New England in Printed Maps 1513-1800: An Illustrated Carto-Bibliography, 724.1. Portinaro, P., and Knirsch, F., The Cartography of North America 1500-1800, pl.116. Van Ermen, E., The United States in Old Maps and Prints, p.47. Sellers, J. and Van Ee, P. M., Maps and Charts of North America and the West Indies 1750-1789, 807. Manasek, F. J., Collecting Old Maps, 73. Baynton-Williams, Checklist: Printed Maps of New England to 1780, Part IV: 1700-1780, #1716.01b.